'Good weather for ducks' is probably the best way to describe conditions on the final day of the 2013 Musto Vice Admiral's Cup, where grey was the predominant colour and oilskins were the preferred attire (good news for sponsor Musto!). Fortunately nothing could dampen the spirits of the 58 competing teams who took on two final races to decide this hugely competitive series. Winds were predominantly from the northeast, but with some very big shifts and velocity ranging from sub five to around ten knots the tacticians and trimmers certainly got a strenuous workout. Once again Rob Lamb took the small boat fleet onto the Bramble Bank and Bob Milner returned to the Ryde Bank area with the big boats. Tony Langley's Weapon of Choice continued to dominate the TP52s of Class 0, scoring two further wins to take the series by a five-point margin. Sir Keith Mills' 5°West and Johnny Vincent's Pace traded places through the day with each boat claiming a second and a third place but it was 5°West which took the second podium step with Pace five points behind her. After racing double Olympic Silver Medallist and Abu Dhabi Ocean Racing Volvo Race skipper Ian Walker, who was guest starring as tactician aboard Weapon of Choice, was full of praise for his crew's teamwork and expertise and also paid tribute to the race committee saying: "They did a good job to get the racing in, particular in today's conditions. It was a fun regatta and we had some really close racing." In Class 1 for the Farr 45s, Jeff Blue's Espresso Martini and Stewart Whitehead's Rebel both did their best to unseat overnight leader Kolga, owned by James French, but ultimately Kolga tenaciously hung onto her lead and won the final race of the series and the regatta by six points from Espresso Martini. Rebel won today's opening race and followed this up with a third, which put them onto equal points with Espresso Martini, but was pushed down to third on count back. The final result of the J/111s in Class 2 went down to a protest between Duncan McDonald and Phil Thomas's Shmokin' Joe and Tony Mack's McFly regarding a pair of incidents on the run into and rounding of the leeward mark in the final race. McFly protested Shmokin' Joe about an overlap issue in the approach to the mark, followed by a claim that their spinnaker sheet made contact with the mark. The Protest Committee elected to hear both protests together and ultimately found that Shmokin' Joe had not infringed. A very relieved Shmokin' Joe crew was delighted to claim overall victory in the class from James Arnell's Jeez Louise. Having had to pull out of yesterday's race seven David and Kirsty Apthorp's J-Dream was back in the hunt today and a third and fourth place put them into third overall, just one point ahead of McFly. In Class 3 for the J/109s, William Edwards' Fardonyx and David Richard's Jumping Jellyfish battled it out for supremacy with each boat adding a and second and a first to their totals. For Jumping Jellyfish the hard work paid off with overall victory by a confident 12-point margin, but Fardonyx had to settle for fifth overall having been unable to compete on the opening day. The battle for second and third was incredibly close with half a dozen boats in contention for a podium place going into the day. Paul James of Jigsaw had held second place on count back from Tony Dickin aboard Jubilee, but just couldn't seem to find traction in the difficult conditions and after two disastrous results dropped down into sixth. Jubilee meanwhile played it conservatively taking a third and fifth and put themselves onto the second step of the podium. Thanks to a third place in the final race Steve and Jody Maine's J2eau snatched third overall, just one point ahead of Andy Johns and David Rolfe's Shadowfax. The Quarter Tonners in Class 4 saw their second dead heat of the series, between Sam Laidlaw's Aquila and Louise Morton's Espada for fourth place in race seven. Once again this historic revival class provided some of the best thrills and spills of the day with two different race winners in the shape of Willy McNeill and Mike Pascall's Illegal Immigrant in race seven and Rob Gray's Cote in race eight. Peter Morton aboard Bullit had to be content with a pair of second places, but this was enough to give him the overall series by 4.5 points. The tussle for second and third went down to the closing moments of the final race with Aquila grabbing second from Rickard Melander's Alice II by two points. 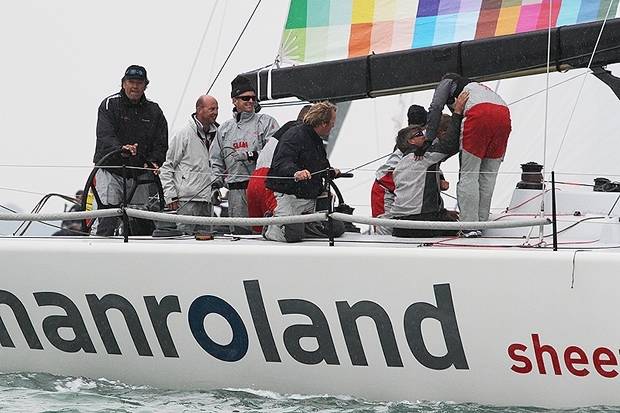 For many of the Quarter Ton teams this was a first opportunity to test their metal against their competitors in preparation for the 2013 Quarter Ton Cup, which will be hosted by the Royal Corinthian from 15-17 July. Among the new faces in the fleet were Richard Fleck and his crew sailing Per Elisa who were delighted with their ninth place with Richard saying, tongue in cheek, "anywhere was better than last!" Also very pleased to be racing against the full Quarter Ton fleet for the first time was Panic's new owner Geoff Gritton, who had travelled down from the East Coast specially for the event. Having completely refitted Panic over the past winter they were looking extremely smart and were very pleased to achieve several top ten results. "It's been a steep learning curve but we've loved it and are looking forward to racing against the full fleet in July," said Gritton. The Llewellyn/Wakefield/Vigus partnership's Henri-Lloyd/Forelle Estates had put in such a consistently good performance in the SB20s Class 5 that they did not need to sail in the final race, winning the regatta overall by eight points. While the winner might have been clear cut, second through fourth were anything but, with three boats all tied on 22 points at the end of the series. On count back Jerry Hill's Sportsboatworld.com took second place from Scott Graham's Chill Pill+, with Craig Burlton's Gill Race Team sliding into forth. Sadly Mark Lloyd's Chaos was unable to race today, giving Andrew Pearce's Ker 40 Magnum III a clear run at victory in the two-boat Class 6 for 39-43 footers. Although they were already certain of victory, Magnum III still elected to come out and race today and make the most of the great courses laid on by the Musto Vice Admiral's Cup race management teams. Speaking at the prize giving, event originator and winner of Class 4 Peter Morton thanked event sponsor Musto for their most generous ongoing support of the regatta. He also paid tribute to the competitors for making this one of the biggest Musto Vice Admiral's Cup entries ever and recognised that the success of the event was entirely down to their good will and enthusiasm. Originally conceived as a fun way to fill the gap left by the cancelled Admiral's Cup of 2005, Peter noted that the event's willingness to evolve to meet the sailors' needs was a major part of its appeal and he asked everyone to continue providing their feedback to help with future planning.